Cinderella - the ultimate Disney Princess...loved for her kindness as much as her beauty. Ella's story has been told by many, but none as memorable or popular as Disney 1950's classic animated film. ...Unless you're my daughter Ashley(who was about 5 at the time), then your favorite is a German telling of the story dubbed over in English, and badly I might add. It's in black and white and there are no birds or mice to help Cinderella, there is however a chicken coop where she has to hide and her step sisters cut off toes and part of their heels in order to fool the Prince into thinking they are the true owner of the slipper...we must have watched that move 1,000,000 times. I promise we wore it out! For me it was the Rogers and Hammerstein musical that I could only watch one time a year on television. There was something so special about only being able to see it that one time, and if you missed it you had to wait an entire year - kids today will never understand that excitement. The music was fabulous and I still remember singing "In my own little corner in my own little chair..." for days afterward. I thought Leslie Ann Warren was the most beautiful person on the planet, she was mesmerizing. The entire production was amazing. For Lexi's generation Cinderella is opening in theaters TODAY! I am sure it will be as iconic for her as Ashley & my versions are for us. The previews I have seen are wonderful (don't you just love her blue dress) and some of the reviews I've read say "opulent", "uplifting", "an old tale told well" and "surprisingly fresh." It's a movie I can't wait to experience with both my daughter and granddaughter. Thank you to my wonderful friend DISTherapy for use of her beautiful photo. 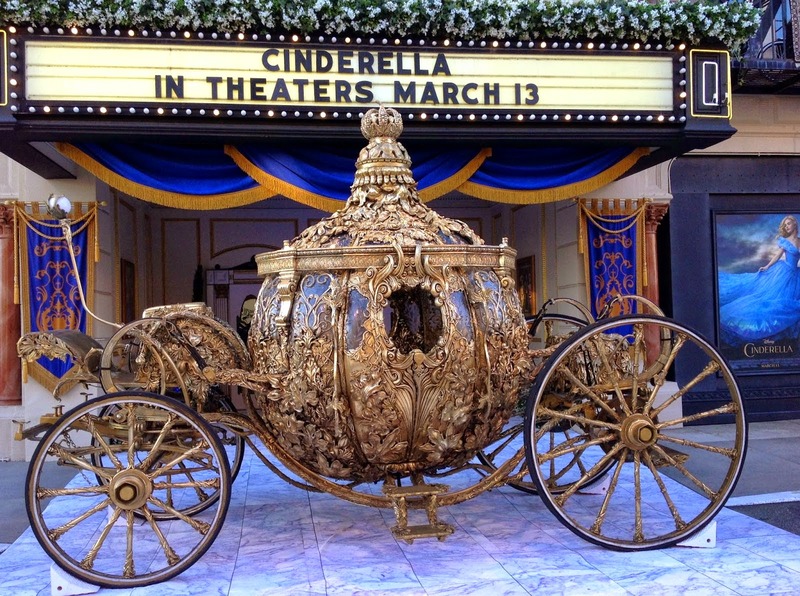 "The carriage, created under the direction of Academy Award-winning Production Designer Dante Ferretti, was custom built for “Cinderella.” Decked out in gold leaf and measuring 10 feet tall and 17 feet in length, the carriage weighs nearly two tons – although it looks light as a pumpkin!" You still have time to see it for yourself, the carriage will be there until April 11, 2015! Be sure to post your pictures with the carriage on Facebook, Instagram and Twitter and use the hashtag #Cinderella when you do. If you go to see Cinderella this weekend I would love to hear what you think about the movie. Leave a comment below on my Facebook page. P.S. If Cinderella gives you the fever to visit Walt Disney World I would love to help! As a member of the Guru Travel, LLC team of Disney Authorized Vacation Planners I am ready to help you plan your most Magical Disney vacation ever. Click here to request your free, no obligation quote or email me at donnakay@thewdwguru.com.